VDOT recently installed wayfinding signage on the Fairfax County Parkway trail between Route 50 and Route 29. FABB has been advocating for these signs since we formed in 2005. Thanks to VDOT and Fairfax County for working together to install the signs. The trail diverges from the Parkway in this area and continues along West Ox Road to reconnect with the Parkway just south of Route 29. Until now trail users were left to fend for themselves. Several cyclists have said they have gotten lost when the Parkway trail suddenly diverted from the Parkway at Monument Drive and West Ox Rd. These signs will be a big help to all trail users. 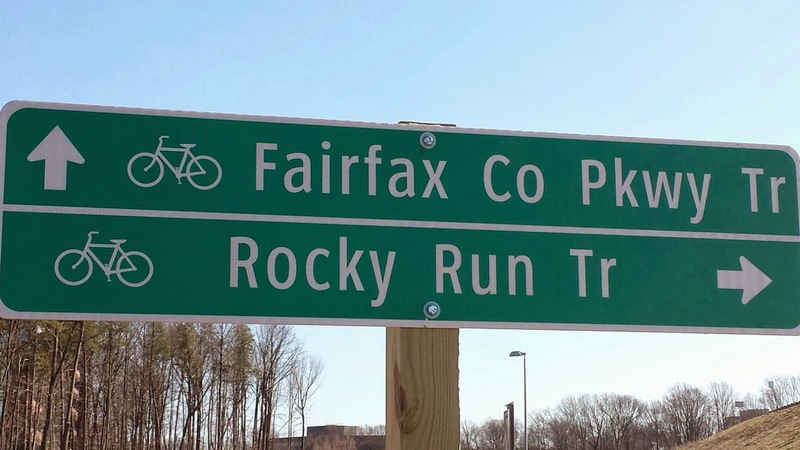 The county recently allocated $80,000 to place signs on the full length of the Fairfax County Parkway and Franconia-Springfield Parkway (item 117 on Approved Projects List). In other news about the Parkway trail, work will begin this month, starting at the Route 7 end, on repairing and repaving sections of the trail. FABB worked closely with VDOT to identify needed repairs and to develop a strategy for informing cyclists about the progress of the work. Fairfax County Parkway Bike Trail Signs – VDOT placed a series of new signs to help Fairfax County Parkway trail bicyclists navigate through Fair Lakes. The FC Parkway bike trail separates from the main roadway in Fair Lakes in order to avoid I-66 ramps. Cyclists are directed onto trails on West Ox Road and Monument Drive or Fair Lakes Drive. VDOT coordinated with FABB (Fairfax Advocates for Better Bicycling) and Fairfax County DOT.